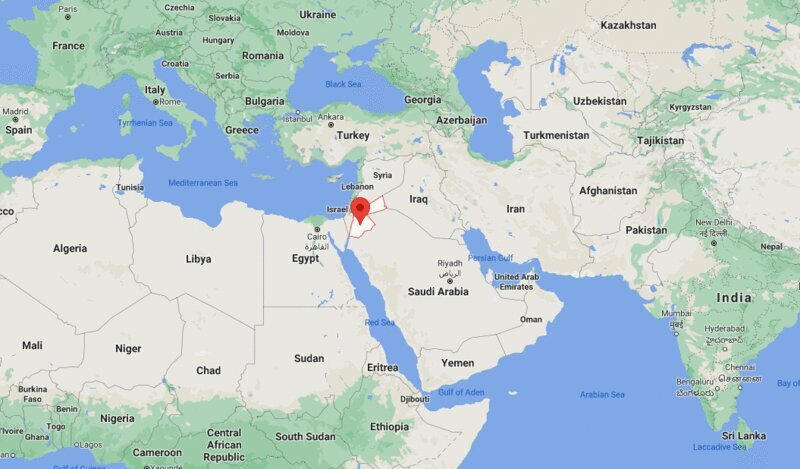 Where is Jordan located on the world map? Jordan is a small kingdom located in the western part of Asia. It shares its international boundary with Saudi Arabia in the east and south-east, Iraq in the north east, Syria in the north and Israel in the west. Jordan has very small coastline that opens in the Red Sea south western part of the country. In this small opening, Jordan has only port at the Gulf of Aqaba, which is also shared by Israel, Egypt, and Saudi Arabia. Most of the Jordan part is covered by the extensive Arabian Desert; but north-western part has the Fertile Crescent. The government type of Jordan is a constitutional monarchy with representative government. The ruling monarch is use to be the chief executive and the commander-in-chief of the armed forces. However, the king exercises his executive power through the prime ministers and the Council of Ministers. The judicial branch of Jordan is an independent branch of the government. In the modern era, Jordan is considered as predominantly urbanized country and even the Human Development Report categorized it as the country of �high human development.� In addition, country has been also considered as an emerging market with a free market economy. Surprisingly, it has more Free Trade Agreements in comparison to the any other country in the region. Jordan has "advanced status with the European Union.� The key feature of the Jordan climate is humid i.e. from November to March and semi dry weather for the rest of the months. So, the country has a Mediterranean-style climate. Moreover, country has some of the developed cities including the capital city Amman. For the Jordan tourism; the developed cities are quite attractive. Above all, the most important point of attraction for the tourists in Jordan is Dead Sea. It is not only the deepest point on the earth but also one of the saltiest water bodies on the earth. Surprisingly, people do not sink into the sea; without making any effort people keep on floating on the water surface. So, whenever plan to visit Jordan, must take bath in Dead Sea to experience a complete new world.